This breathtaking composition is another example of the magic with which Bruce Munro and his team infuse his creations. Spanning the nave, the Light Shower in the ancient Salisbury Cathedral was switched on during the Darkness into Light procession to mark the start of Advent in late November 2010. Though ethereal, Light Shower covers a massive area of 700m3. 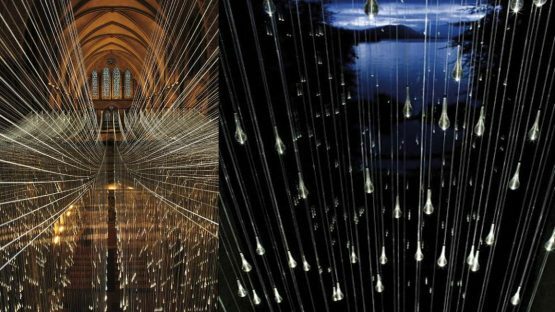 Light Shower took 400 man hours to make and 232 man hours to install. It involves 50Km off HBF400 high performance fiber divided into 1984 strands, each one tipped by a ´Teardrop´ diffuser, and powered by 8 x 150 watt MDI101 metal halide illuminators. All photos by Mark Pickthall.